(1) Prices are based on a composite of several commonly prescribed brand-name drugs for a typical quantity of pills. For some cells in the table, the relative relationships have been calculated based upon our mail pharmacy and PBM operations and on other relationships widely reported by industry sources. (2) These prices are used for illustrative purposes only and do not represent any type of overall average. 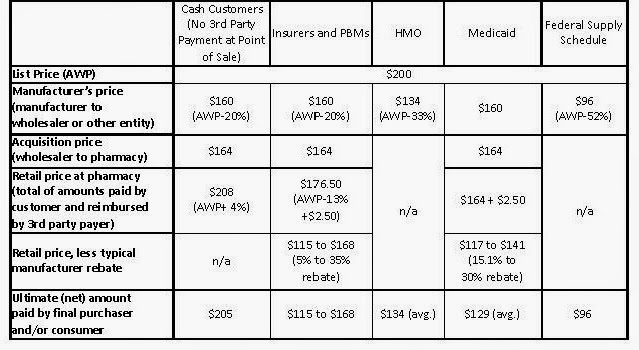 (3) Prices reported in this table include both amounts paid by third-party payers and amounts paid by the consumer as cost sharing. (4) Manufacturers generate up to 85% gross margins on brand pharmaceuticals. (5) The HMO column refers only to HMOs that buy directly from manufacturers.